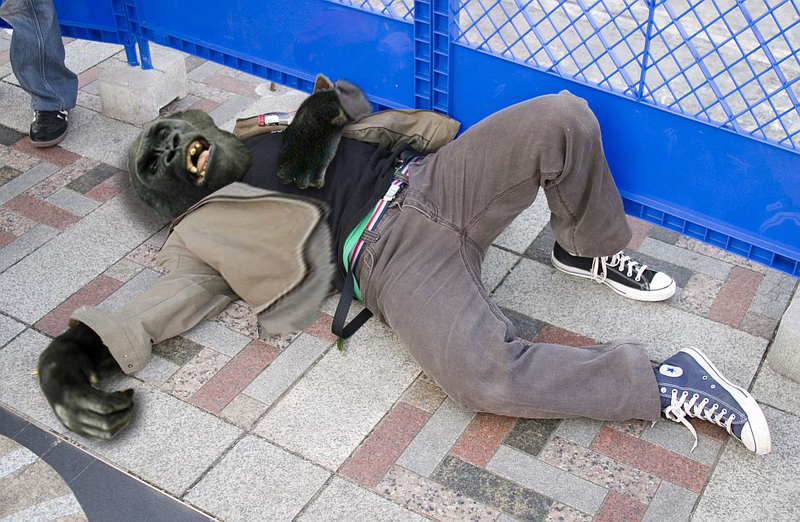 If gorillas get drunk and pass out, and you’re their true friend, you should take pictures of them. When they sober up, show them the pictures and ask them if they’re proud. If they’re honest, they’ll say no and check themselves into rehab. If that doesn’t work, post the pictures on Facebook and tell all your friends to share it with their friends. Eventually your gorilla friend will find out what you did and rip your arms off for making a fool out of them. But, Some day your gorilla friend will come around and thank you for caring enough to jeopardize your friendship by posting the pictures. But, honestly, you’ll probably still be pissed at your gorilla friend for ripping your arms off and all the thank yous in the world won’t mean much to you at that point… unless you get some way cool robot arms from the government. That would be awesome! Share this picture so I can get some way cool robot arms! This entry was posted in If Gorillas... and tagged coolest gorilla picture ever, gorillas, gorillas get drunk, passed out gorilla, silverback fight, silverback gorillas. Bookmark the permalink. ← Greatest Sign at a Rally Ever!